게재된 논문을 학회에서 발표하거나 온라인에 올리면 저작권 문제가 있을까요? 저작권 문제는 일반적으로 동일한 저작/그림을 다른 저널에 재출판하거나 저작권이 다른 출판사에 있는 정보를 제공하는 것과 관련되어 있습니다. 하지만 학회에서 출판된 저작을 발표하는 것은 허용되는 일입니다. 일부 포스터 발표는 저널에 프로시딩으로 발표되기도 하지만, 대개는 그렇지 않습니다. 더욱이 발표 방식이 다르고 포스터는 논문과 비슷한 방식으로 게재되지 않기 때문에 저작권 문제는 없을 것입니다. ResearchGate에 있는 pdf 파일의 경우 이상적으로는 모두 쉽게 이용할 수 있는 오픈 액세스 논문이어야 합니다. ResearchGate 웹사이트에는 저작권 문제에 관한 기본적인 정보가 게시되어 있습니다. 이 웹사이트에서 제공되는 논문은 저자가 제공할 권한이 있는 논문, 즉 오픈 액세스 논문이어야 합니다. 따라서 논문이 오픈 액세스로 출판되는 한 ResearchGate를 통해 공개될 수 있다고 생각하신 것은 맞습니다. 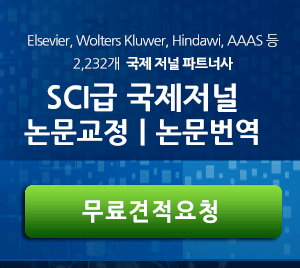 하지만 항상 이를 따랐던 것은 아니고 ResearchGate에 대한 우려가 제기된 후 저작권이 있는 논문에 대한 접근 제한을 동의하게 되었습니다. <h2>게재된 논문을 학회에서 발표하거나 온라인에 올리면 저작권 문제가 있을까요? </h2><br><p style="text-align: justify;"><span style="font-size:10.0pt"><span style="font-family:&quot;맑은 고딕&quot;"><span style="color:#212529">우연히 학회 발표장의 학회 포스터에서 이미 게재된 논문을 봤습니다. 저작권 침해 아닌가요? 또한, ResearchGate에서 게재된 논문의 pdf 파일을 봤습니다. 이것이 허용되나요? 논문이 오픈 액세스로 게재되었다면 문제가 되지 않을 것 같은데 제가 이해하고 있는 것이 맞는지 궁금합니다</span></span></span></p><p style="text-align: justify;"> </p> <p style="margin:0cm 0cm 0.0001pt; text-align:justify"><span style="font-size:10pt"><span style="word-break:keep-all"><span style="font-family:&quot;맑은 고딕&quot;"><span style="color:#212529">저작권 문제는 일반적으로 동일한 저작/그림을 다른 저널에 재출판하거나 저작권이 다른 출판사에 있는 정보를 제공하는 것과 관련되어 있습니다. 하지만 학회에서 출판된 저작을 발표하는 것은 허용되는 일입니다. 일부 포스터 발표는 저널에 프로시딩으로 발표되기도 하지만, 대개는 그렇지 않습니다. 더욱이 발표 방식이 다르고 포스터는 논문과 비슷한 방식으로 게재되지 않기 때문에 저작권 문제는 없을 것입니다.</span></span></span></span></p><p style="margin:0cm 0cm 0.0001pt; text-align:justify"> </p><p style="margin:0cm 0cm 0.0001pt; text-align:justify"><span style="font-size:10pt"><span style="word-break:keep-all"><span style="font-family:&quot;맑은 고딕&quot;"><span lang="EN-US" style="color:#212529" xml:lang="EN-US">ResearchGate</span><span style="color:#212529">에 있는 pdf 파일의 경우 이상적으로는 모두 쉽게 이용할 수 있는 오픈 액세스 논문이어야 합니다. ResearchGate 웹사이트에는 </span><span lang="EN-US" style="color:#007bff" xml:lang="EN-US"><a href="https://explore.researchgate.net/display/support/Copyright"><span lang="EN-US" style="color:#007bff" xml:lang="EN-US"><span style="text-decoration:none"><span style="text-underline:none">저작권</span></span></span> <span lang="EN-US" style="color:#007bff" xml:lang="EN-US"><span style="text-decoration:none"><span style="text-underline:none">문제에</span></span></span> <span lang="EN-US" style="color:#007bff" xml:lang="EN-US"><span style="text-decoration:none"><span style="text-underline:none">관한</span></span></span> <span lang="EN-US" style="color:#007bff" xml:lang="EN-US"><span style="text-decoration:none"><span style="text-underline:none">기본적인</span></span></span> <span lang="EN-US" style="color:#007bff" xml:lang="EN-US"><span style="text-decoration:none"><span style="text-underline:none">정보</span></span></span></a></span><span style="color:#212529">가 게시되어 있습니다. 이 웹사이트에서 제공되는 논문은 저자가 제공할 권한이 있는 논문, 즉 오픈 액세스 논문이어야 합니다. 따라서 논문이 오픈 액세스로 출판되는 한 ResearchGate를 통해 공개될 수 있다고 생각하신 것은 맞습니다. 하지만 항상 이를 따랐던 것은 아니고 </span><span lang="EN-US" style="color:#007bff" xml:lang="EN-US"><a href="https://www.chemistryworld.com/news/researchgate-bows-to-pressure-from-publishers-on-copyrighted-material/3008288.article"><span style="color:#007bff"><span style="text-decoration:none"><span style="text-underline:none">ResearchGate</span></span></span><span lang="EN-US" style="color:#007bff" xml:lang="EN-US"><span style="text-decoration:none"><span style="text-underline:none">에</span></span></span> <span lang="EN-US" style="color:#007bff" xml:lang="EN-US"><span style="text-decoration:none"><span style="text-underline:none">대한</span></span></span> <span lang="EN-US" style="color:#007bff" xml:lang="EN-US"><span style="text-decoration:none"><span style="text-underline:none">우려가</span></span></span> <span lang="EN-US" style="color:#007bff" xml:lang="EN-US"><span style="text-decoration:none"><span style="text-underline:none">제기</span></span></span></a></span><span style="color:#212529">된 후 저작권이 있는 논문에 대한 접근 제한을 동의하게 되었습니다. </span></span></span></span></p><p style="margin:0cm 0cm 0.0001pt; text-align:justify"> </p><p style="margin:0cm 0cm 0.0001pt; text-align:justify"><span style="font-size:14px;"><span style="word-break:keep-all"><span style="font-family:&quot;맑은 고딕&quot;"><b><span style="font-family:굴림"><span style="color:#212529">관련</span></span></b><b> </b><b><span style="font-family:굴림"><span style="color:#212529">기사</span></span></b><b><span style="font-family:&quot;Alegreya Sans&quot;,serif"><span style="color:#212529"> :</span></span></b></span></span></span></p><ul><li style="margin:0cm 0cm 0.0001pt; text-align:justify"><span style="font-size:14px;"><span style="color:#212529"><span style="word-break:keep-all"><span style="font-family:&quot;맑은 고딕&quot;"><span lang="EN-US" style="font-family:&quot;Alegreya Sans&quot;,serif" xml:lang="EN-US"><span style="color:#007bff"><a href="https://www.editage.co.kr/insights/unintentional-copyright-infringement-by-an-author-a-case-study"><span lang="EN-US" style="font-family:굴림" xml:lang="EN-US"><span style="color:#007bff"><span style="text-decoration:none">저자의</span></span></span> <span lang="EN-US" style="font-family:굴림" xml:lang="EN-US"><span style="color:#007bff"><span style="text-decoration:none">의도치</span></span></span> <span lang="EN-US" style="font-family:굴림" xml:lang="EN-US"><span style="color:#007bff"><span style="text-decoration:none">않은</span></span></span> <span lang="EN-US" style="font-family:굴림" xml:lang="EN-US"><span style="color:#007bff"><span style="text-decoration:none">저작권</span></span></span> <span lang="EN-US" style="font-family:굴림" xml:lang="EN-US"><span style="color:#007bff"><span style="text-decoration:none">침해</span></span></span><span style="color:#007bff"><span style="text-decoration:none">: </span></span><span lang="EN-US" style="font-family:굴림" xml:lang="EN-US"><span style="color:#007bff"><span style="text-decoration:none">사례</span></span></span> <span lang="EN-US" style="font-family:굴림" xml:lang="EN-US"><span style="color:#007bff"><span style="text-decoration:none">연구</span></span></span></a></span></span></span></span></span></span></li></ul><p style="text-align: justify;"> </p><p> </p></br><p style="text-align: justify;"><span style="font-size:10.0pt"><span style="font-family:&quot;맑은 고딕&quot;"><span style="color:#212529">우연히 학회 발표장의 학회 포스터에서 이미 게재된 논문을 봤습니다. 저작권 침해 아닌가요? 또한, ResearchGate에서 게재된 논문의 pdf 파일을 봤습니다. 이것이 허용되나요? 논문이 오픈 액세스로 게재되었다면 문제가 되지 않을 것 같은데 제가 이해하고 있는 것이 맞는지 궁금합니다</span></span></span></p><p style="text-align: justify;"> </p><br><a href="https://www.editage.co.kr/insights/could-there-be-copyright-issues-if-a-published-paper-is-presented-at-conference-or-hosted-online">게재된 논문을 학회에서 발표하거나 온라인에 올리면 저작권 문제가 있을까요? </a>는 <a href="https://www.editage.co.kr/insights/">에디티지 인사이트</a>에서 제공되었습니다. 같은 데이터를 두 곳의 학회에서 발표해도 괜찮을까요? 제 논문이 중복 투고로 여겨질까요? 리뷰어가 거절당한 논문을 권위 있는 다른 학회에 제출하라고 제안하는데 어떻게 할까요?